The TCM E.CO.SYSTEM drying line was created to meet the needs of high capacity lines to be installed in very limited spaces in terms of length, by exploiting the height of the factories. It represents a compact solution with a high technological content to guarantee maximum operational flexibility. The single-body dryer integrates the predrying, drying and stabilization phases. The TCM E.CO.SYSTEM dryer is combined with a press, which has a dough mixing system that can be one of the following: Total Vacuum, Stabilization Belt or Traditional Mixer, a 3-tier shaker predryer and a single-tier belt cooler. 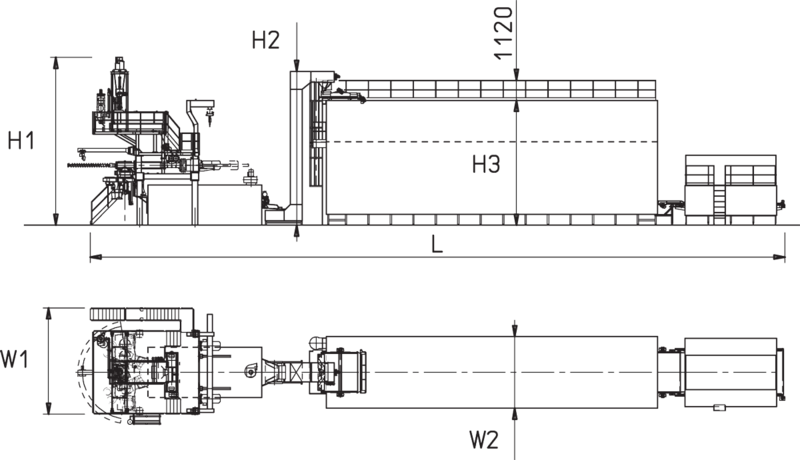 The constructive and technological characteristics of this line allow to obtain ideal drying diagrams for each and every raw material used. The 3-tier shaker exploits an oscillation system that ensures that the product is shook continually, to avoid it from sticking, and that there is an efficient air flow. The shaker is equipped with multiple coils which create optimal temperatures to prepare the pasta for the next drying phase. The sides of the vibratory trays are sealed with special teflon diaphragms to keep small-sized shapes in position despite high pressure ventilation. The TCM E.CO.SYSTEM dryer, thanks to a high efficiency ventilation system with ducted fans, is equipped with a high speed air predryer in the upper tiers. This section is physically separated from the lower drying and stabilization section to maintain independent thermohygrometric conditions. In the lower part of the machine, the ventilation is designed in such a way that the final drying and stabilization phases ensure a perfectly stable product adequately prepared for the next cooling phase.